During our recent trip to Seattle, we visited the local Pike Place Market. The market covers many blocks and offers a variety of fresh vegetables and fruit like a farmers market. Besides that there is various meat, fish and others. We used the opportunity to shop for more fresh fish. We were able to choose the fish we wanted. The fish monger helped us choose the fish and he also filleted the fish and packaged everything in an airplane safe container. The container kept the fish fresh for up to 48 hours. Chris spent the first week of the new year on a mission trip to Haiti. When she returned I had a list of meals I was in the mood for. The first being fresh shrimp from the market. I also knew ahead of time what wine I wanted to pair with the meal. Pale color depth, amber hue. Aromatic young-fruity aromas of pears, apple, melon. Dry, medium-bodied with balanced acidity. Silky soft mid-palate flavors with a creamy medium length finish. Region/Appellation: Napa Valley, Mount Veeder. 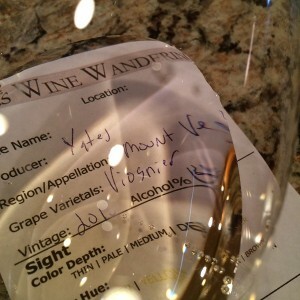 I was able to compare my notes from the 2012 Yates Family Vineyard Viognier. For the most part, the wines were pretty close. 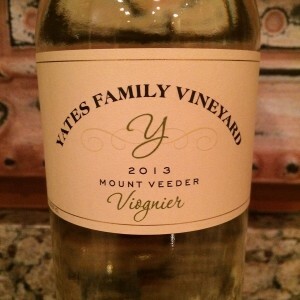 I rated the 2013 Yates Family Vineyard Viognier three glasses this time.